Norman Minetta isn’t exactly a household name, but he’s just as Stormin’ a Norman as General Schwarzkopf when it comes to fighting the wars for Detroit. Minetta’s the Transportation Secretary and, like all good generals, he knows his marching orders, So, no surprise, the newly announced fuel efficiency standards were largely crafted by the boys at Ford and GM and Chrysler. Which is sort of like letting a six-year-old set the menu for the family---all candy-coated sugar-bombs for breakfast and no vegetables at dinner. Like undisciplined kids, Detroit automakers want what gives them a sugar-high and Minetta’s giving it to them. Who cares if it makes them sick? It’s a dying industry here in the U.S. anyway and the easy politics is to give the Big (but getting smaller) Three whatever they ask for so they can’t complain on the way to the poorhouse. “Fleet mileage,” which is an average across all product lines was making Ford more concerned than Moody rating their bonds as junk, because Japanese producers weren’t building the heavy end of the product line. In Ford’s mind that gave them an additional advantage, added to their already superior automobiles. GM screamed that they needed just one more fix before being carted off to the rehab clinic. Chrysler was more quiescent, smugly assuming their Mercedes Benz partner wouldn’t really let them fall off the end of the table. And so it’s Back-To-The-Future with the American producers building muscle-cars and four to five-ton behemouth SUVs as gasoline edges toward $4. Minetta’s candy-coated suicide-pill gives them six categories within which they can hide from logical downsizing, the last of which requires no mileage standards at all. Sneak a peek at Navistar’s ‘pickup’ that marketing executives rave “really towers over what's on the road now in height, standing only a foot below a basketball rim and more than two feet above the Hummer. 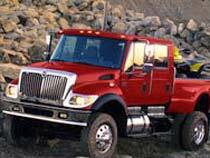 It's not going to fit into the standard garage," said Mark Oberle, a spokesman for Navistar. "We can see it as a vehicle for business people who want to make a distinct impression. For personal use, it's for people who want to make a statement." That’s a statement that impresses the hell out of me. A statement of American excess in full plumage. Not a single Detroit executive admits that deep discounts and finance deals that postpone the pain have become their norm, while Toyota can’t manufacture enough Prius’ to meet demand (at full price). Muscle the market is the banner under which we march, champagne for everyone and don’t stop the music. Consider the muscle-car Dodge Charger, with its 425 horsepower, 6.1 liter engine that does 0-60 in five seconds. That's presuming you can actually keep the tires on the road instead of uselessly burning up. Detroit is once again on the cutting edge. ... and in Canada, where they are now selling the Smart, there are four month waiting lists for the diminutive little cars.